Team Adventure is an ocean sailing group that has educational programs for kids. You can learn more about them here. Update: Anna Coogan sent me a correction concerning Team Adventure. She says, " The 'Team Adventure' that I talked about is a now defunkt kayaking school that I was involved with a kid- not the sailing school that is listed-- close, but probably the new Team Adventure doesn't want to be associated with the old, since it did not end well." Anna, thank you for the heads-up. Anna Coogan sings in a soprano voice that threatens to break, but never does. She uses this to good effect to put over the emotions of here songs. Her acoustic guitar is sometimes the featured instrument, and at other times it blends smoothly into the mix. There are uptempo rockers here, and they work well enough. But the gems are the slower and quieter numbers. Here, drums, bass, and acoustic guitar carry the day, while electric guitar and keyboards provide gentle coloring. Musically, The Nocturnal Among Us is a work of great subtlety. On the uptempo numbers, the electric guitar and keyboards figure more prominently in the arrangements, but there are still subtle pleasures. I must single out the inventive playing of drummer Eric Hastings throughout. Sometimes he barely plays at all, and when he does, he uses mallets or sticks, and uses his cymbals more than you usually hear except in jazz. Hastings thus gets a wide variety of sounds and feels from his kit, but always in service of the song. The Nocturnal Among Us, broadly speaking, is a set of songs about dealing with loss. There are songs about breaks or ends in relationships. And there are songs that contemplate mortality. Coogan’s narrators don’t generally give up. So, the women in the relationship songs often hope that someone who left will return. He will realize he still loves her. Even Back to the World, which opens the album, is but a snapshot of a young man who has returned to his father after giving up his love. The young man is scared of the life he must face, but I was left with the sense that he has nowhere to go but up. Later, Crooked Sea is followed by Take the Sky and Run. Here are two women whose lovers have just left them. One remembers the beautiful feeling of their love, and is sure that he must return. The other is just as sure that she will be able to shake this off, and learn to live and love again. Later still, a song called Love Again offers assurance that is possible to do just that, and that it will happen in this case. I mentioned earlier that there are also songs that contemplate mortality. You might not recognize So Long Summertime as one of them if you did not know the story behind it. The song depicts a difficult person, full of contradictions, but the narrator ends by promising to be there for him. Given Coogan’s comments on the song, it is clear that this is less of a promise, and more of an apology given too late. Holy Ghosts of Texas is actually and older song that Coogan rerecorded for this album. It works thematically, and is one of the slow numbers I most enjoyed. The narrator here describes the kind of afterlife he wants. Coins on Your Eyes feels like a hymn, and is a beautiful send-off for the dead. Finally, there is the title track close the album. Taken literally, this could be a song about dieing. But metaphorically, it could describe the end of a relationship. So the song ties the album together thematically, and makes the perfect closer. One thing Coogan does as a writer that I really enjoyed was enhancing the emotion of a song by using nature imagery. Done badly, this can wreck a song’s emotional power, by making it seem fluffy. Coogan never has that problem. She knows just how far to go with a metaphor or an image. Crooked Sea is a good example, but my favorite is Mockingbird. The song is a beautiful work musically as well. The song begins with a simple but powerful pattern played just by the drums. Then the rest of the band joins in, and Coogan sings a soliloquy to the mockingbird of the title. The narrator goes from bemoaning her fate to accepting that her relationship has ended, and you are left with the sense that she is finally ready to build something new. The rest of the band disappears, and the drum figure from the beginning repeats a couple more times, and then the song ends. Exactly the same drum figure feels completely different at the end, because of what has happened. 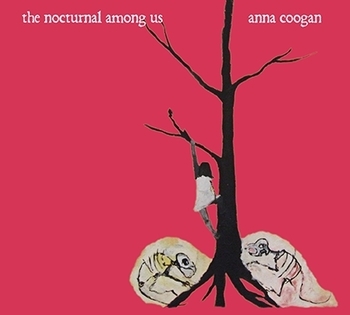 Anna Coogan has done two previous albums, but The Nocturnal Among Us is my introduction to her work. It has made a strong first impression.